Of the five post cards I walked away with from the antique store in Indiana I found this one the most interesting. First of all the artwork is fantastic. The colors are still stunning even though the card is postmarked February 23, 1910! The edging of the card is a metallic gold. My scan does not do it justice. The card is not a colorized picture but rather a small reproduction of art and I’m guessing that the sender of the card spent more than average on this card! The date is interesting. It is pre-World War One and related to the American Navy. 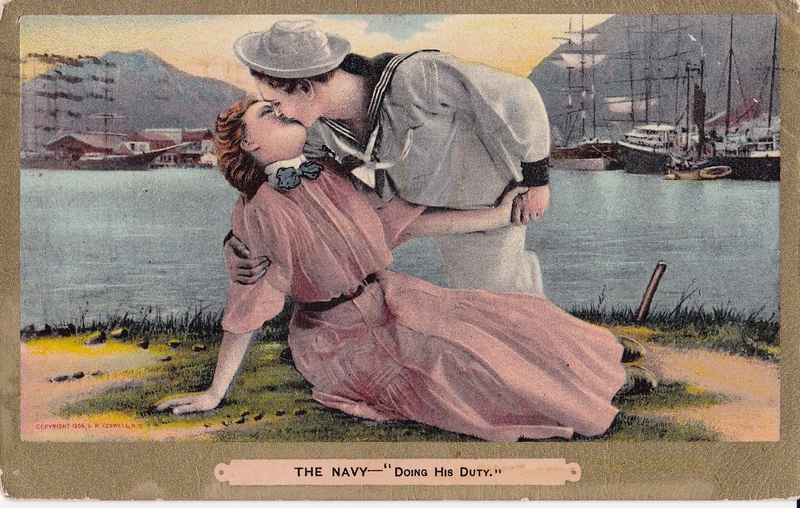 The caption, “doing his duty” is humorous but also an indication about how sailors and soldiers feel about the girl they left behind. 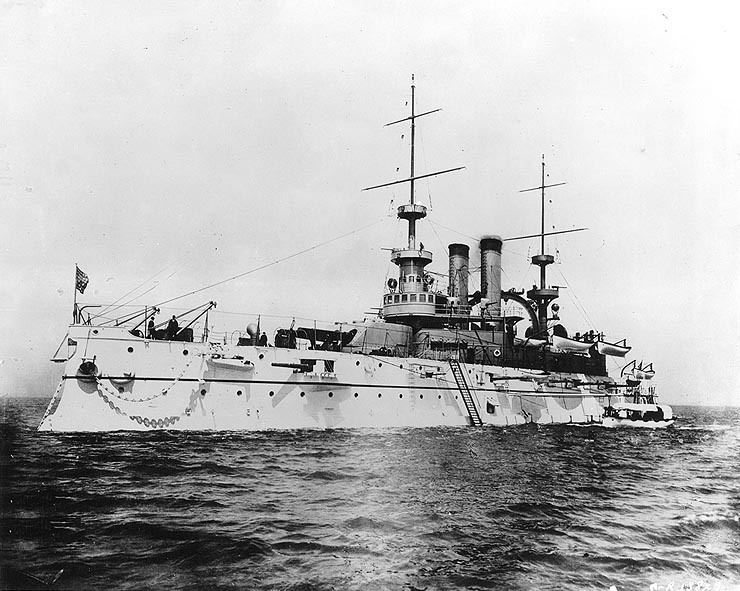 The 1910 date reveals that the American Navy of the period was the Great White Fleet (pre-dreadnought era). 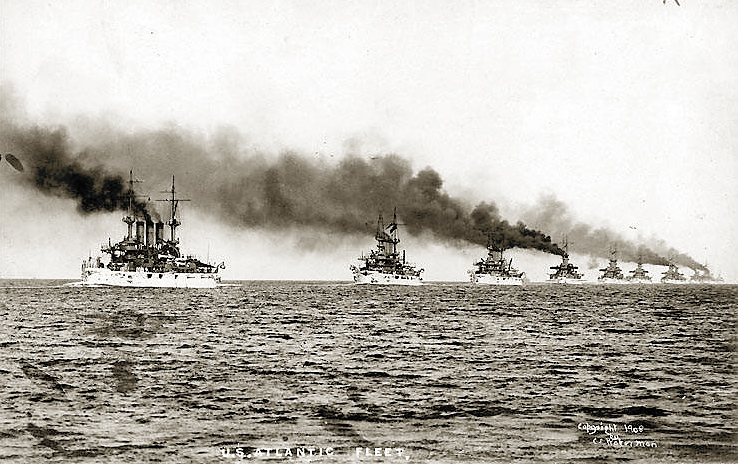 The Great White Fleet was the popular nickname for the United States Navy battle fleet that completed a circumnavigation of the globe from 16 December 1907 to 22 February 1909 by order of U.S. President Theodore Roosevelt. It consisted of 16 battleships divided into two squadrons, along with various escorts. Roosevelt sought to demonstrate growing American military power and blue-water navy capability. Hoping to enforce treaties and protect overseas holdings, the U.S. Congress appropriated funds to build American sea power. Beginning with just 90 small ships, over one-third of them wooden, the navy quickly grew to include new modern steel fighting vessels. The hulls of these ships were painted a stark white, giving the armada the nickname “Great White Fleet”. 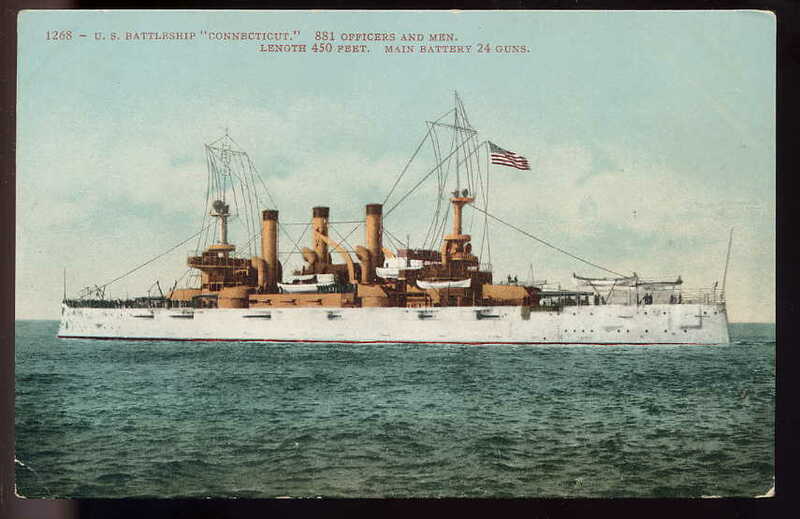 USS Connecticut-another postcard with similar artwork to my find. Pre-Dreadnought Battleship, USS Wisconsin, named for my home state. The Wisconsin and the other ships of the Great While Fleet were obsolete by the time of America’s entry into WW1 (April, 1917) such were the advancements in battleship technology. The Wisconsin was activated however and used in coast patrol duties along the Atlantic Coast. 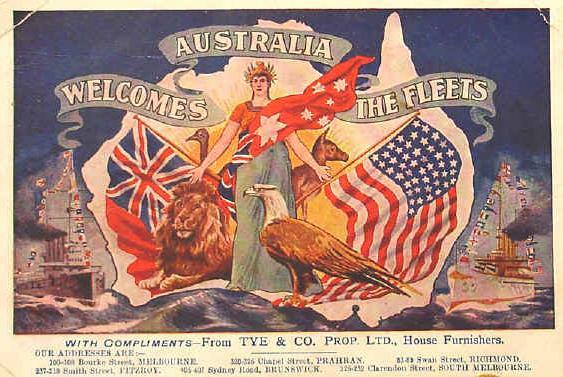 Colorful postcard featuring Australia welcoming the Great White Fleet. The other side of the card is also fascinating. It’s addressed to Miss Eleanor Reed, 523 Madison Drive, Ann Arbor, Michigan, The message to Miss Eleanor is upside down on the card and is in German! The card was sent from Sturgis, Michigan. I could find nothing in particular Navy related to Sturgis but did find that Sturgis had a sister city in Germany ( Wiesloch, Germany). 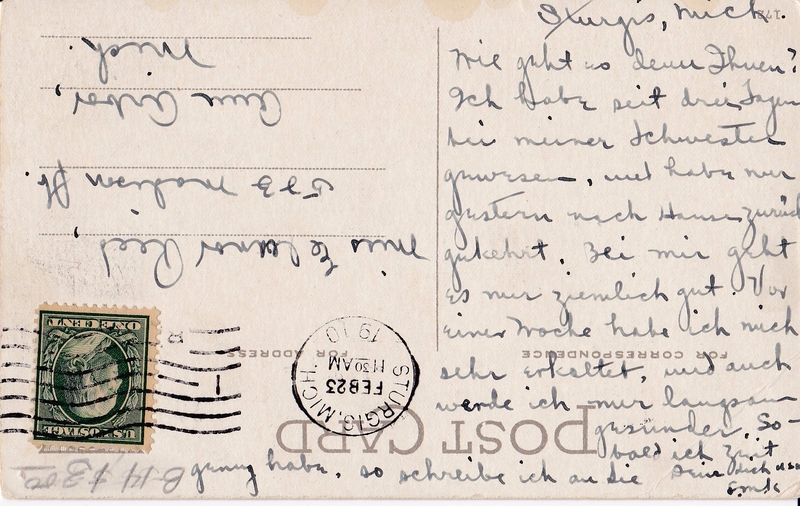 I do know that in the later years of the 19th century and early years of the 20th century the US took in many German immigrants so it’s not so unusual to find a US postcard written in German to another German speaker. Unusual today but probably common in 1910 as many American cities had a high proportion of 1st or 2nd generation German immigrants. In a message to me Simone speculates a bit as to whether or not Eleanor was Frank’s girlfriend. Simone notes that Frank uses the more formal “Sie” than the less formal “du” for the English word “you.” The use of “du” would indicate a girlfriend perhaps while “Sie” is more respectful and used with strangers, teachers or older people. Whatever the case I think the card is interesting and a glimpse into German\American culture c. 1910.